Is there anyone in the world who doesn’t like s’mores? If there is, I certainly haven’t met them. Last month when I visited Big Sur with my husband and friends, we ended each day by making s’mores in the wood fireplace. It was Jen’s idea, and it was a good one. The sound of the crackling fire called us in, and none of us were ever able to stop at just one. 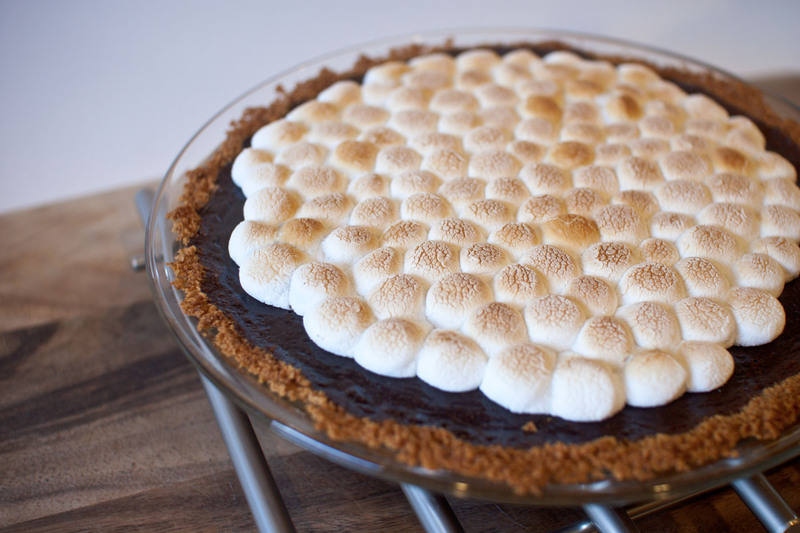 Our craving for s’mores expanded well past the dates of our trip, and I wasn’t surprised when Jen showed me the recipe for this s’mores pie. She had made it for her husband, and I knew I had to try it, too. It’s everything you love about a s’more — the nostalgia, the stickiness, the sweetness — all without the campfire. It’s the best s’more you’ll ever have. In a medium bowl, combine graham cracker crumbs and melted butter until everything is coated. Press the mixture into the bottom of a 9-inch pie plate. Bake for 8 to 10 minutes or until the crust is lightly browned. Meanwhile, combine heavy cream and milk in a small saucepan and whisk over medium heat until warmed. Add chopped chocolate and salt and whisk until completely melted. Slowly whisk in the eggs until the mixture is smooth and well blended. Carefully pour the chocolate into the prebaked crust and bake for an additional 15 to 20 minutes or until the chocolate filling is set and doesn’t move when the pie is gently shaken. Place the marshmallows in concentric circles on top of the pie (if you have large marshmallows, cut them in half with kitchen scissors first). Set the oven to broil, and put the pie under the broiler (watching it carefully) for approximately 2 to 5 minutes or until the marshmallows have browned slightly. Let the pie set in the refrigerator for at least 2 hours. To serve, use a sharp knife sprayed with cooking spray to slice. The Pasty Affair recommended nuking each slice for 7-or-so-seconds before serving, and I also recommend doing the same. It’s good cold, but really good warm. Oh my gosh! A thick layer of chocolate. Yes please! This pie looks PURRFECT! You make me starving. Had a s’mores pie from Hoosier Mama this year as my “birthday cake.” Yes, I love s’mores, and I love them even more in pie form. As soon as I recover from my Take 5 Bar Halloween candy binge (I know, I know! ), I’m giving this beauty a try. I love Take 5, so I totally understand the binging. Wow, sweet pictures. You must have a great tripod. Wow! This might be the best thing ever! I need to make this. Yummy! You totally just made my day. Love s’mores but I never seem to make them enough. I can definitely see this on my Thanksgiving table. This looks so good. Yum! I actually made this pie a few months ago (pre-blog days), so I KNOW how delicious it is. YUM! Those marshmallows look beautiful. I have been known (on more than one occasion) to make myself sick from eating too many s’mores. I think this pie could be the death of me. But it would be a good way to go. Ooo, decadent indeed. That looks incredible, you’d have to hide it from me. Those little toasted marshmallows on top are TOO CUTE! This, my dear, is a marvelous idea. I can’t believe how perfect your pie looks! Amazing! And, anyone who doesn’t like s’mores is weird. Hi! I just discovered your site and I have to say I love your blog name as it gave me quite a laugh. 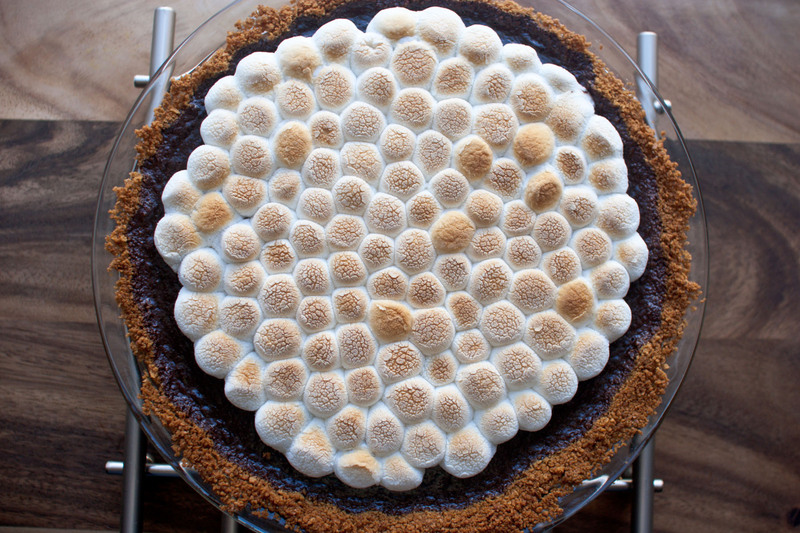 Anyway, this pie is right up my alley because I seriously love s’mores. I love making my own marshmallows and graham crackers so I already have the ingredients on hand. Yum! I’ve made my own marshmallows too, but watch those under the broiler. They tend to melt a lot faster than the store bought ones. …..>.> I don’t like classic s’mores…… Please don’t hate me. I really don’t like graham crackers as crackers. 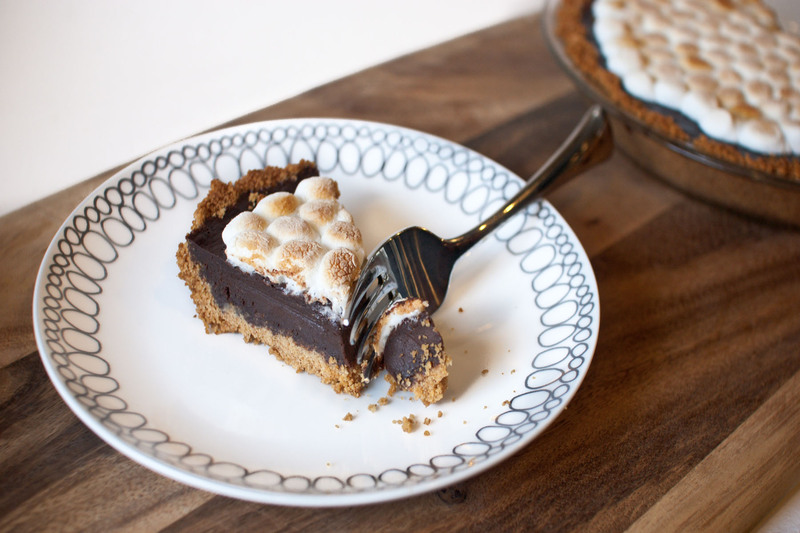 I love a graham cracker crust though – and this pie looks awesome! What if, instead of broiling the pie to toast the marshmallows, you use a flame torch? You definitely could do that, too. Although the broiler is nice because it ensures that everything browns evenly. This pie has to be a favorite. Doesn’t everyone love S’mores? Hello! I had been eyeing this recipe for some time thinking “I need to make this!” But I had never had the time (I did though because I didn’t realize how little time it actually took). But I had made a goal to make it for New Years Eve and I did! It was so easy and fast to make with simple household ingredients, but it looks like it took forever! And it was so good! I do suggest to NOT to use Ghirardelli chocolate because I did, and it was MUCH too rich so we have to eat it in small increments. And also it’s very important that you use a cooking spray or olive oil on the knife you are cutting it with because I didn’t listen to that and the marshmallow is much too sticky to cut through without it. Thank you for the recipe it made for an excellent New Year! I’m so glad you liked it! Happy new year to you, too. This is the best one i’ve seen yet! Definitely going to make it!